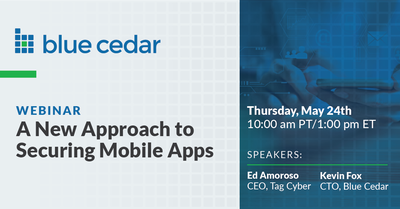 Please join me and Dr. Ed Amoroso for this interactive webinar on securing mobile apps in the era of edge computing. As more organizations work to leverage the power of mobile, IoT and other edge devices—one critical issue remains to be solved: how do you secure sensitive data and the enterprise assets involved? This upcoming webinar will cover the evolution of mobile apps in the enterprise, and why the measures typically used to secure them fall short. We'll also explore an innovative, app-centric approach to mobile security. I hope you can join us next Thursday. If you have any questions about the webinar please email, marketing@bluecedar.com.